We are delighted to announce that we have successfully migrated all clients over to the new Virtualizor VPS control panel. 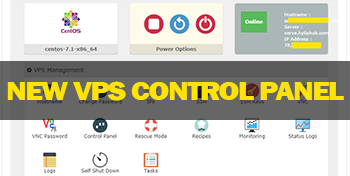 The new VPS control panel gives clients much more control of their UK and US VPS servers from within their D9 client area, without the need of logging into an additional VPS control panel. And if you’re reading this and don’t currently have a VPS, check out the screenshot below to see an example of the new VPS control panel in action. Remember that this control panel is integrated directly into your D9 client area, so there is no longer a need to log into an additional control panel to manage a VPS.